Umm okay, that didn’t turn out too well. As you saw from my Facebook and Twitter posts, I moved my stop loss to break even ahead of the October 17 deadline last week. Not only that, but I added to my position at 98.87 when the Senate came up with a last-minute deal. And why not? 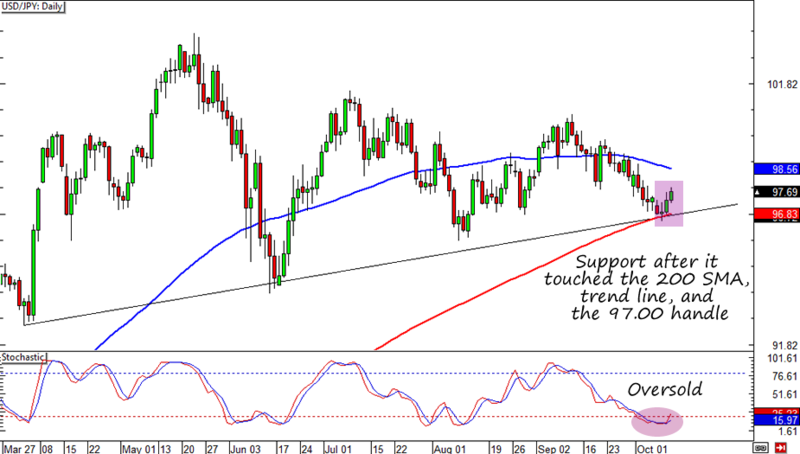 USD/JPY looked like it was finally breaking above the 100 SMA at time. Unfortunately, we saw a buy-the-rumor-sell-the-news scenario. 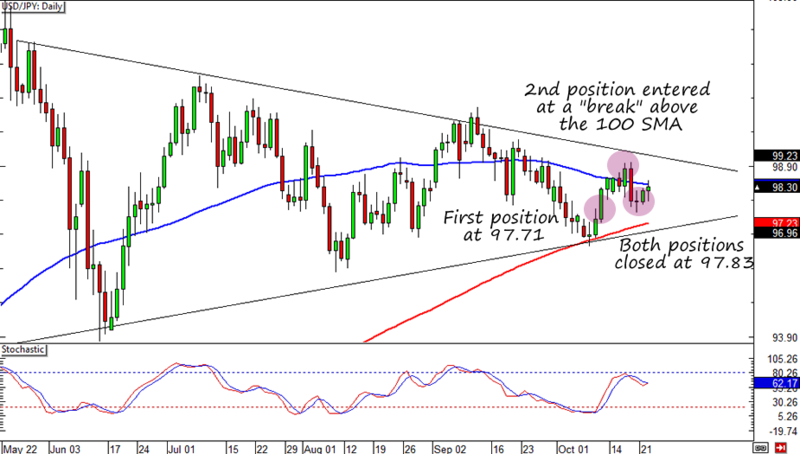 The pair barely touched 99.00 before profit-taking and risk appetite weighed on USD/JPY. The pair hit my adjusted stop loss at 97.83 and put a 0.29% dent on my account. One thing I learned from this trade is that I could have closed my position altogether for a profit ahead of a big news event. I could have just entered another position when a clear breakout can be seen. Another thing is that I should have placed wider stop losses given that I was trading the daily chart of a yen pair. With only a few hours left before Treasury Secretary Jack Lew’s October 17 debt ceiling deadline, it’s time for me to protect my profits! I moved my stop loss to 97.73, which is almost at my entry level. I considered taking off my position altogether, but I figured that I’d probably kick myself if Washington does come up with a last-minute deal and USD/JPY shoots up. I can’t NOT adjust my stop loss either, especially since Stochastic is almost on the overbought zone and price is currently finding resistance at the 100 SMA. Good thing that USD/JPY’s price action has given me the opportunity to adjust to a risk-free trade! Phew! Now I just have my fingers crossed as I wait for the October 17 deadline. How about you? Got any open trades this week? 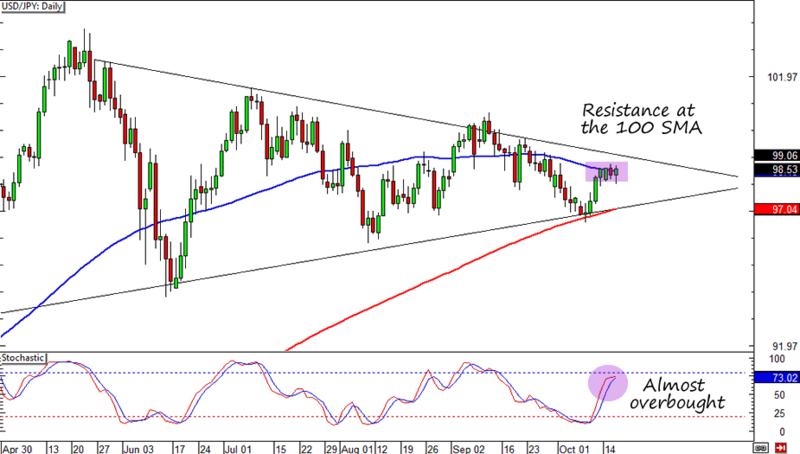 Is USD/JPY gearing up for an upward move? I hope it is! Although I pointed out a short day trade setup on this week’s market analysis, one look at USD/JPY’s daily chart convinced me to take a long trade instead. The pair had just bounced from the 97.00 handle, which isn’t surprising given that it’s also near a rising trend line and 200 SMA support. The pair is also showing what looks like a three-bar turn around the major psychological handle. Last but definitely not the least, I see that stochastic is about to leave the oversold area. On the fundamentals side it also looks like the dollar bulls have the advantage. The lack of progress in Washington is making investors jumpy, which is inspiring risk aversion and dollar strength. Others are also buying the Greenback due to expectations that the U.S. won’t default by next week. And then there’s the latest BOJ policy decision, which showed hinted that the central bank is still determined to hit its inflation targets. I went long at market (97.71) and risked 0.4% of my account. I placed a 120-pip stop loss because it’s right below this week’s low and the trend line and SMA support areas that I’m watching. I’m planning to add another 0.4% if the pair goes back to 97.00 or if pops up sharply without retracing. My initial profit target is at 100.00 for a 1.91:1 trade but I’m willing to close early if dollar or yen sentiment changes. That’s my trade idea for this week! What do you think?